Surprised? Well I am too! 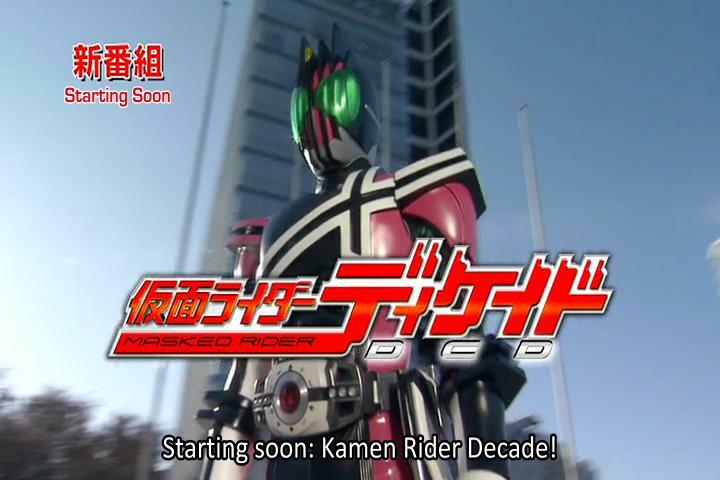 Some of you might know that I previously scrubbed 17 episodes of Decade, with some help from other groups. For episodes 20-21 Magenta (of Over-Time fame) was going to handle those episodes. Well, imagine my surprise when one day he handed me a script for episode 1 instead, and declared that he wanted to retranslate the whole show! Originally we were going to release 1-19 in a batch torrent ( as is MFC tradition when redoing shows like this) but the upcoming Kamen Rider Wizard special kind of threw a wrench in that plan. Instead we’ve decided to release these first three episodes to give people who have never seen Decade a bit of a taste. 4-19 will still be done in a proper batch later on. But for now, grab your camera and get ready to Journey through the Decade (again). BONUS: We’ve included the preview for episode 1, and the Journey through the Decade PV. The PV contains two subs tracks. One is Kou’s Translations of the song (which is what we’ve used in these releases), and the other is Magenta’s. As another special bonus, we’ve also included two sub tracks in episode 2. Episode 2 features a few instances of untranslated Grongi in the dialogue. Grongi, for those unaware, is the language the monsters in Kuuga speak. The default track leaves this Grongi unsubbed, but the secondary track has it translated (Magenta speaks Grongi btw). Unlike the Grongi in Kuuga itself which was eventually subtitled for it’s Toei Channel reairing, this Grongi was not. It was purely put in for fans of Kuuga who could actually decipher this stuff. The rest of the story important Grongi though was subbed in Japanese. Consider it a little incentive to rewatch these episodes if you’ve seen them before.